The time of year has come when a lot of us started a deep cleaning so everything is fresh for Spring through winter.. I started mine recently and my goodness, I have so much more crap stuff to go through yet. 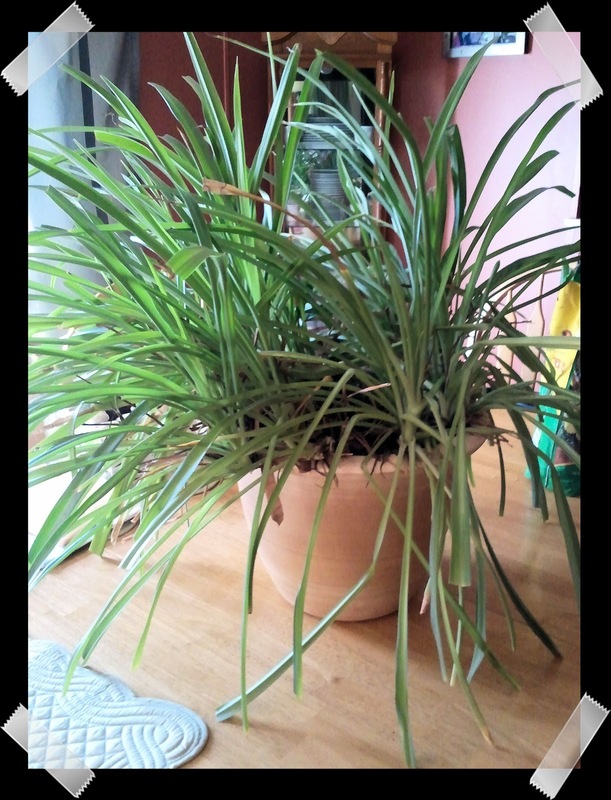 I began simply, with the help of Mr. L.. We decided our plant needed a new home. He, yes I call my plant a he an no I'm not crazy, well maybe a little bit was so beyond overgrown the roots were pushing the entire plant out of the pot! This is what he it looked like before. 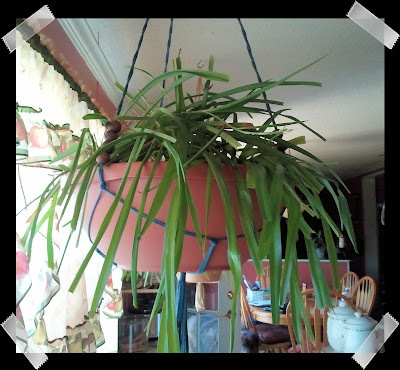 You can see how it's falling out of the pot. 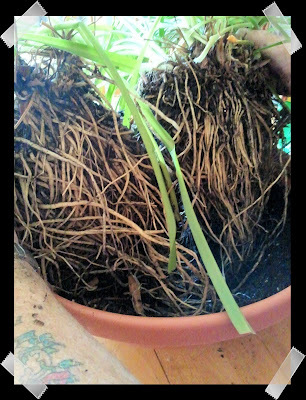 This is the huge root mess we found when Mr L. removed the plant from the pot.. It was a HUGE mess. I couldn't get the roots apart. Mr. L. had to use a knife and scissors to cut through them. Here he it is after a much needed diet in his it's new home....Now I just have to pray he it doesn't go into shock and die on us.. 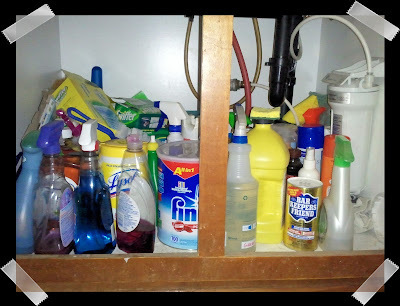 I also started cleaning out cabinets.. Today I started with the mystery mess under the kitchen sink and then moved onto the other scarey mystery mess under the sink in our master bathroom.. 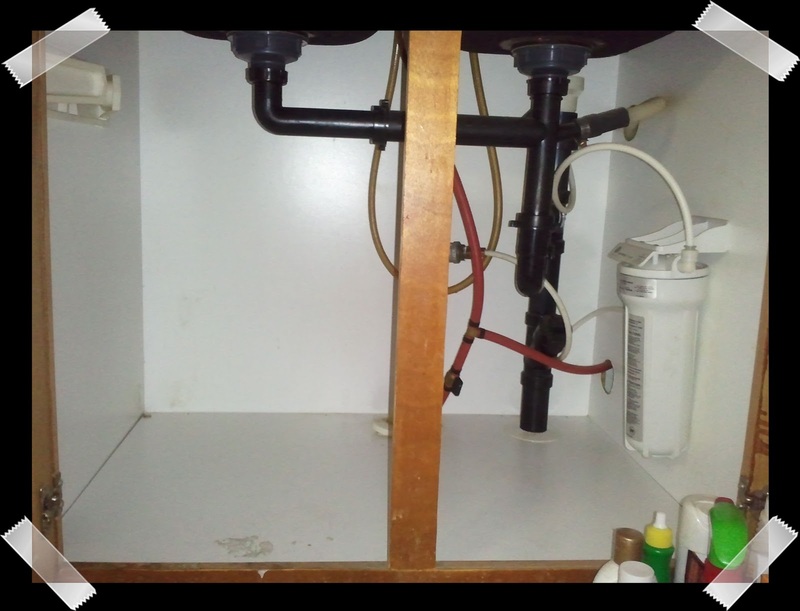 Under the kitchen sink before.. I couldn't ever find anything, I always just threw everything under there and ended up with multiples of the same item because I thought I didn't have anymore . All nice and clean, c'ept for the stain Mr. L. couldn't get out.. I almost hated to put anything back in ..
And here is the finished product. 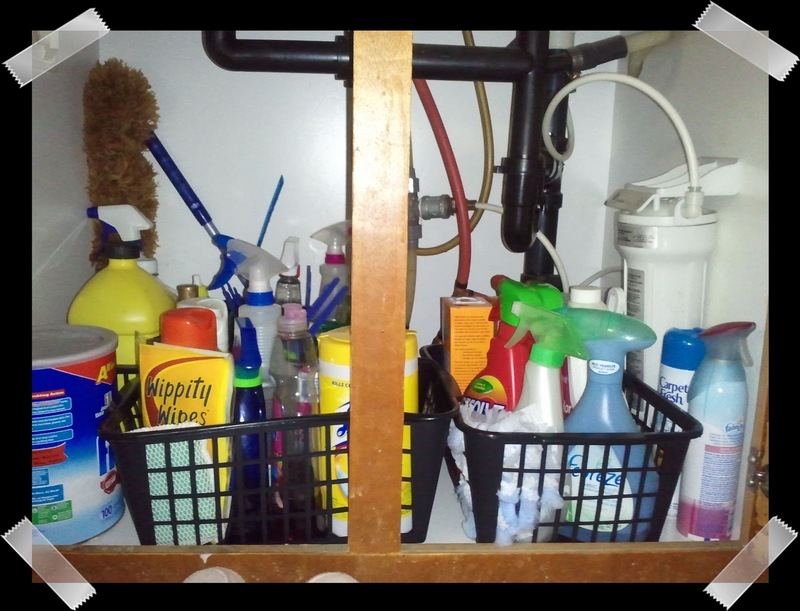 I threw out a lot of old bottles, things I had no idea of what they were, things that could walk on their own and I put everything in baskets according to category.. NOW I can see what I actually have, need or don't need. Sorry about this photo, I started cleaning out under the master bathroom sink before I remembered to take the photo. 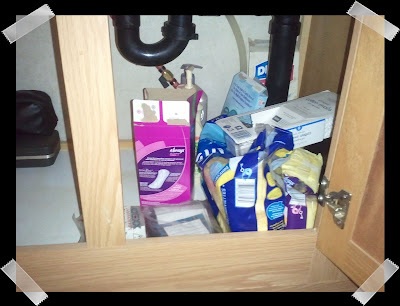 Here's half the mess anyway.. Yeah, um, sorry about the feminine products but what else do you expect to find under there? We're all friends anyway right? 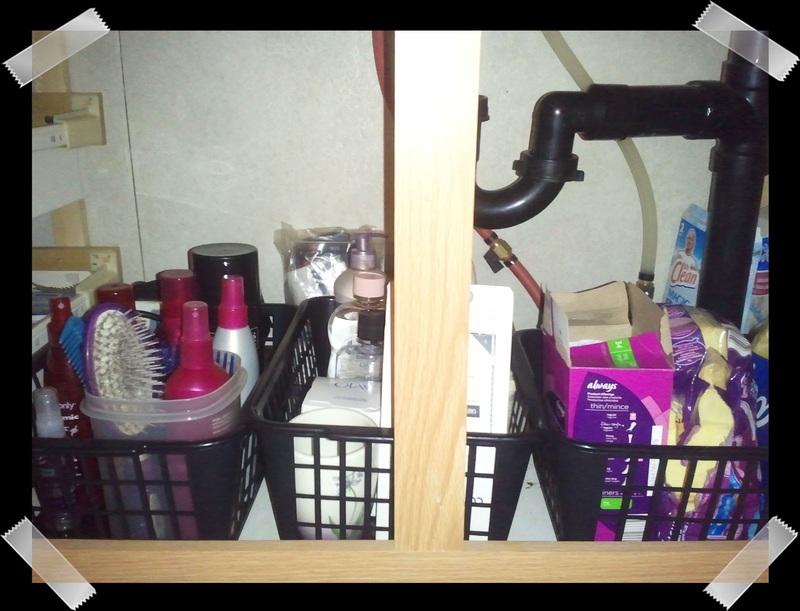 Here we are all cleaned out and categorized in baskets.. Do we really need all this junk in our lives? I have enough hair product under here for 10 heads.. but I am happy that now I can see what I actually do have and how much of it I really DONT need but being the beauty junky I am, I won't part with it... No, you do not have to call Hoarders! Yes I know, the feminine products are still in the photo but yaknow, it could be worse.. atleast it's not laxatives, or enema bottles right? Lastly, Mr. L. and I on Saturday went down to Lowes. 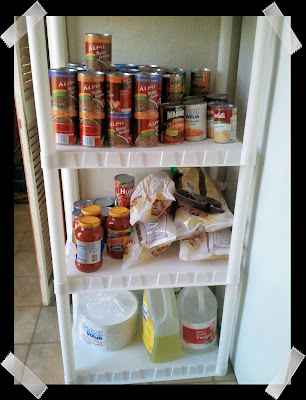 I needed new shelving in my very small utility room since I don't have a pantry.. We had this old hard plastic flimsy display thingy that was not only cracked, the shelves were beginning to buckle under the weight.. I knew any day that shelf was going to give out. We checked around Lowes for quite a while. Did you know, shelving can be SUPER expensive?! I wanted to go with wood shelves but after seeing the price I quickly changed my mind and went with a heavy duty plastic.. Sorry I didnt get a photo before I took this out..Once again, I forgot to take the picture. 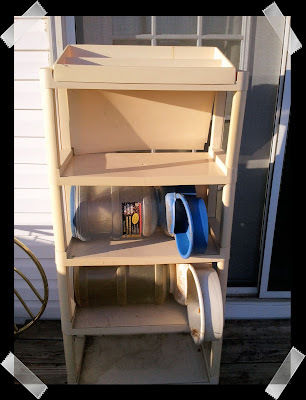 This is the ugly plastic thingy we had.. and I don't wan to tell you what we found behind it when we moved it. Suffice to say, thank goodness for Mr. L's. hand strength and a cleaner called Greased Lightening. And here is the new beauty. 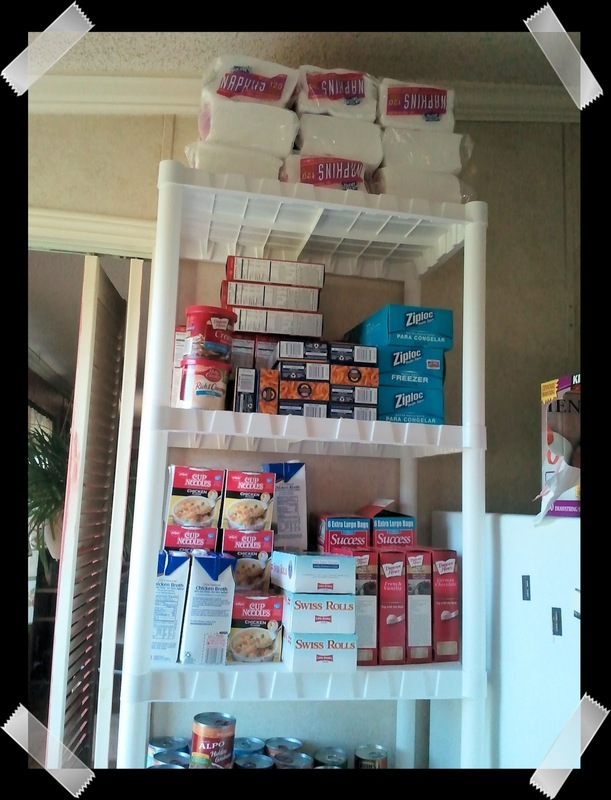 It's a 7 foot shelf and while I need a step ladder to reach the top 2 shelves, it fit perfectly and everything I needed to store fits an has room. Once again, I can see what I now have. I had to separate it into two photos. Here is the top of the new shelf. and here is the bottom half.. I still have lots to clean out but at least I am getting there. How about you? Do you Spring clean and if you do, have you started yet? LOL!! You're too much.. I do a little at a time.. I can't do to much all at once or I end up in massive pain, so each day or every other day I start a new place in the house. Little by little it gets done..
One closet down today lmao you motivated me!! !